2. MOU between the School Education Dept..Govt. of A.P. and KEF on 04-07-2017. It is decided to conduct 3 days Capacity Building Programme for 105 MEOs and all DyEOs in the State in 2 different spells. Spell - 1 is from 22nd November, 2018 to 24 November, 2018. For Srikakulam, Vizianagaram, East Godavari, West Godavari, Krishna and Cruntur Districts. Spell - 2 is from 28th November, 2018 to 30th November. 2018. For Prakasam, Nellore, Chittoor. Cuddapah, Anantapuramu and Kurnool Districts. 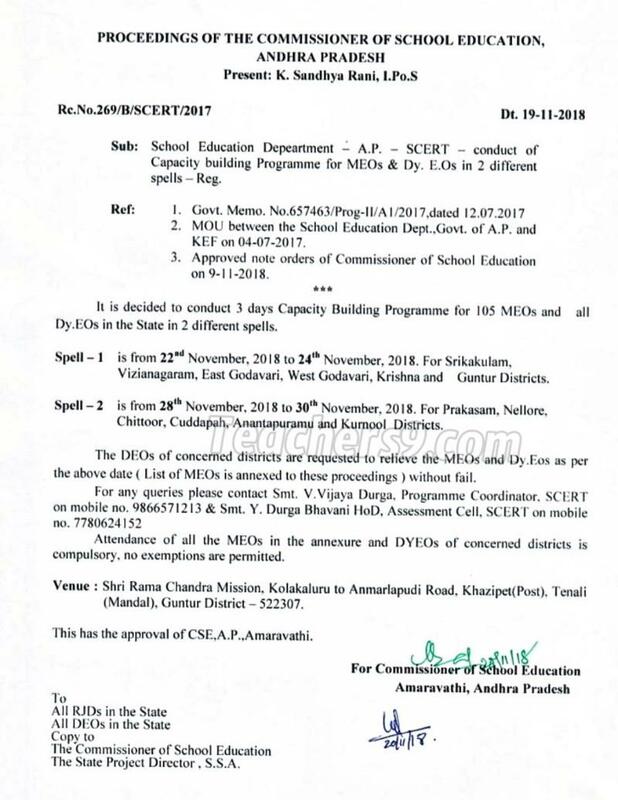 The DEOs of concerned districts are reyuested to relieve the MEOS and Duos as per the above date list of'MEOs is annexed to these proceedings ) without fail. Attendance of all the MEOs in the annexure and DyEOs of concerned districts is compulsory, no exemptions are permitted. Venue : Shri Rama Chandra Mission, Kolakaluru to Anmarlapudi Road, Khazipett (Post). Tenali (Mandal). Giuntur District - 522307.